We were sitting in a room waiting for the young cast to come in when the silliest thought popped into my head. We were about to interview the majority of Dragon Army. I felt like a reporter in the Enderverse, chosen to fly up to Battle School to talk to the future heroes of Earth before they headed off to some undisclosed location. And then Academy-award nominated actress Hailee Steinfeld walked into the room and snapped me back to reality. The first time I’d seen young Hailee was on screen when she was just thirteen years old. I sat in the theater with my husband watching True Grit and thought, “Just who the hell is this girl?” She blew me away. I went home and looked her up and was astounded to learn that she’d been among 15,000 girls that auditioned for the role of Mattie Ross. Watching her stand her ground with the likes of Jeff Bridges and Matt Damon while barely a teenager, I knew she was someone special. An Academy-award nomination would later confirm I wasn’t the only one who thought that. 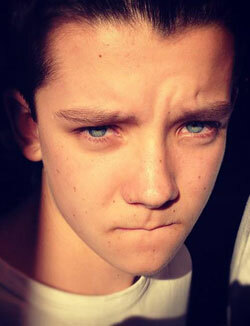 And then, before we knew it, Asa Butterfield had walked into the room. The first thing you notice about Asa (pronounced ay-sah) is how slight he is in stature. So while many of you may be having a hard time with his height, he still has this vulnerability to him because he is so thin. That is, until he stares you in the eyes. A piercing blue, our Ender Wiggin has an intense stare, one that would make any fan somehow comforted by the fact that the person playing him can make you feel intimidated even if he’s less than half your age. During our interview with the producers, Linda McDonough had related a story to us about a time when the kids just couldn’t stop laughing. Under pressure to keep on schedule, the producers were agitated when the laughing spread to the crew. Hailee and Asa gave us a bit more insight into just what was so funny. Stunt coordinator Garrett Warren had put them into a wheel harness they called the “hamster wheel” that flew them around. At one point the two of them were upside down, wearing their really tight helmets. Off the set, the kids didn’t have much to do in New Orleans since none of them were 21, so they simply hung out together. “I think the weekend is really our time to relax so there’s just kind of going over to each other’s houses or just laying low, really. Just spending time together is, you know, the best.” said Hailee. This included things like Aramis teaching the other boys basketball and Asa teaching Suraj how to beat box. When we asked about the pressure of adapting such a classic novel with a longtime fanbase, Steinfeld said she didn’t look at it as pressure so much as an honor. “I told my mom […] one of the main things I want to do in this is still appeal to the massive cult that already follows Ender’s Game.” said Asa. As we chatted with Asa and Hailee, a monstrous man walked in the door. Being a die-hard Game of Thrones fan since the 1990s, I simply knew him as Xaro Xhoan Daxos. Nonso Anozie, who plays Sergeant Dap, had to bend over to get into the room. He then sat down and crossed his massive arms. We certainly wanted to know too! “He shouted.” confirmed Asa, and everyone laughed. “After my initial few scenes I was walking around for a few days with a hoarse throat; I was screaming pretty loud.” said Anozie, chuckling. Eventually, we were joined by a large group of cast members: the rest of the jeesh. Aramis Knight, Suraj Partha, Caleb Thaggard, Khylin Rhambo, and Conor Carroll rolled into the room and started telling us what they’d pick to take from the set. Aramis wanted the little compacted mouse they’d used earlier that day. Khylin would keep his flash gun. Caleb and Nonso said they’d definitely keep their desks. “They’re really, really cool. A lot of the stuff is working, a lot of the stuff you can actually hold and pick up. That’s the thing I like about this movie, the things you can actually grab hold of.” said Anozie. They’ve talked extensively in other interviews about going to Space Camp for training and they were more than excited to tell us about all the muscles they’d developed with all the physical training involved. 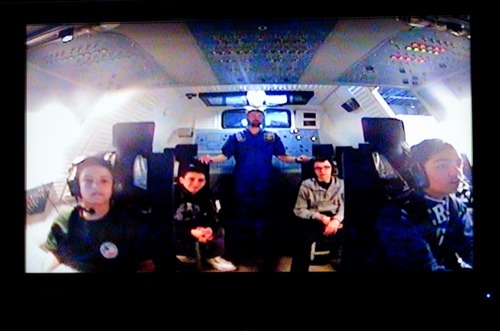 While at Space Camp, they even got fly a simulator, though none of them were good at it except for Suraj. “I literally crashed my plane at least 17 times.” admitted Conor. To get themselves riled up for filming, they’d chant and even gave us a demonstration. “We had a bunch of different chants. As mentioned in our talk with Christine Bieselin-Clark, the flash suits were fantastic, but when we asked if they were comfortable… “NO. No, no.” they all agreed. “My favorite looking is the flash suits.” joked Khylin. The way Suraj tells it, getting dressed in their flash suits sounded like the scene in Ender’s Shadow when Bean has to jury rig his suit to fit his small body and it’s in pieces at his feet. “I don’t think that anyone is ever going to realize that to get these things on we had like 4 people on us tugging at the pants, trying to get the jacket over, and trying to zip this up so this is.” And Bean did chime in on the difficulty. Lucky for them though, there was no strict diet. Just a friendly reminder here and there to stop growing so fast, though the training would make them bulk up enough where the initial fitted suit was too tight. “I almost fainted. It was like getting hugged by Nonso.” said Khylin. Even so, cast-mate Moises would always try his best to keep the rest of them eating right. Just as Caleb was telling us about setting a toaster on fire while trying to toast a S’mores Pop Tart, Nonso dropped the bombshell on us. He’d never had one. “They’re like little toasty things with jam inside?” he asked. Our set visit reports will conclude tomorrow with our interview with stunt coordinator Garrett Warren, set designers Ben Proctor and Sean Haworth, and Sir Ben Kingsley.